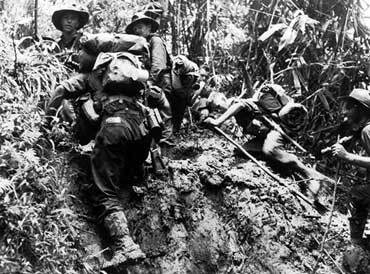 During the advance of the 25th Brigade to recapture Kokoda, on 6 October 1942, the 2/33rd Battalion reached the southern edge of Efogi Ridge. Here the 3rd Battalion, AMF, passed through to prepare a dropping ground near Efogi Mission. On the same date the 2/25th Battalion was at the junction of Kagi-Myola tracks and the 2/31st Battalion was at Nauro. On 7-8 October, 2/33rd Battalion buried 99 dead from the 21st Brigade killed a month earlier on Mission Ridge and Brigade Hill. On 9 October the battalion moved forward to reconnoitre Myola and on 10 October bivouaced at No.1 Myola dry lake where the 3rd Battalion prepared another dropping ground. In mid afternoon a 2/33rd Battalion platoon patrol moved out and by dark reported they had encountered strong opposition on a razorback ridge at the crest of the track. On 11 October, the 2/33rd Battalion was ordered to capture Templeton’s Crossing several hours ahead and below the ridge. Then began a battle against a Japanese force of battalion strength which had dug in to a depth of 1800 metres, carefully siting many small weapon pits reinforced with heavy logs. Not all pits were occupied so that machine gunners could manoeuvre to cover attacks from any direction. At a height of 2,300 metres it was very cold with incessant fog and dim light, because of the dense overhead canopy, thus prohibiting attack before mid-morning. There was little sleep throughout the action because of foul weather and the close proximity of the enemy. Scrambling on hands and knees up the precipitous slopes and along the ridge, attack after attack by companies was repulsed because of the enemy’s vast territorial advantage, but gradually during bitter fighting the battalion, with great tenacity, gained the hard yards until by early on 15 October the ridge had been cleared. This action was extremely important because it secured the large Myola dry lakes which were urgently needed for the dropping of supplies and establishing medical bases. The Japanese knew that whoever held the ridge controlled the dry lakes and this explains their strong defence of the position. During the attack, 100 Japanese were killed and a significant but unknown number wounded. Losses of the 2/33rd Battalion were 21 killed and 48 wounded. As a result of this action the battalion was awarded a number of decorations.